I'd like to introduce these super talented artists who have joined their beautiful voices to create Dala. Amanda Walther and Sheila Carabine of Dala write and sing in harmony best described as angelic. 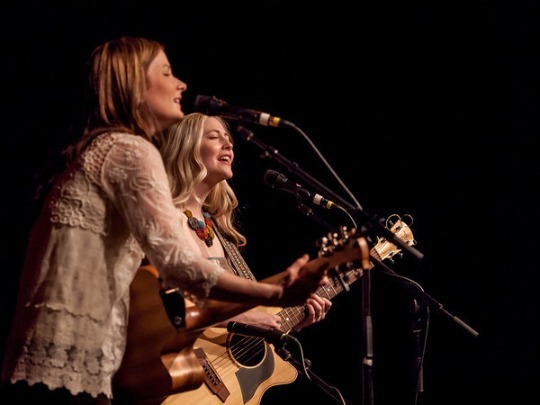 These two best friends met in their high school music class in 2002; they have since released five albums and toured extensively across North America. 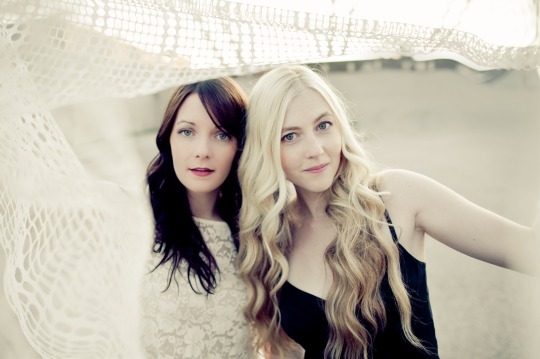 Darlings of the Canadian music scene, Dala are now poised to bring their fresh brand of acoustic pop music to the world. And I've been lucky enough to interview them sometime ago! I LOVE Dala. Not only for their beautiful voices and charm, but for their style. I've always loved indie, folk and unique music and Dala is one of my favorite bands. I adore their fashion sense too, very organic & boho inspired. I'm very glad to share this interview with you. Hope you like it! BM: Tell us a little bit about Dala, When did you girls start working together in the band? (a little bit of your background as well). Dala: Amanda and I are best friends. We met in our high school band class in Scarborough Ontario, and in the beginning we wrote and sang in harmony just for the fun of it. Amanda also has a background in visual arts, crafts and sculpture, and I love poetry, sketching and yoga. With every new song and new show, music quickly became our main focus and passion. We have been writing, recording and touring professionally now for 5 years. BM: What’s your main inspiration? Dala: I am inspired by the things I experience as a young woman, and by my relationships with others. I can't force it - I'm either inspired to write a song, or it just doesn't happen. It's a very moody pursuit. BM: How would you define your style? What’s Dala’s philosophy? Dala: I would say that we have an honest style. Our harmony as friends, songwriters, singers and performers is at the heart of what we do, and we want to share that harmony with our audience. BM: How and when you girls decided this was the right time to spread your wings and pursue your dreams? Dala: We both pursued post-secondary education, but all the while music was beckoning from the wings. Our friends, family and fans were very encouraging, and eventually we both decided to commit fully to the dream in order to make it a reality. BM: Where can we purchase your lovely music? Are there any upcoming events or shows? Dala: You can purchase our albums (we have 5, as well as a live DVD) through our website www.dalagirls.com . You can also check out our show schedule for any upcoming performances in a town near you! BM: Any singers or bands you admire? Dala: I love Neil Young, Frank Sinatra, Joni Mitchell, Bob Dylan, The Fleet Foxes and The Beatles. Dala: I love to sketch, do yoga, run, write and read poetry and practice speaking French. Amanda is a superwoman- she quilts, crochets, makes clothes, makes Excel spreadsheets and gardens. And that's just in one day! BM: What advice would you give to young talented artists who want to spread their wing? Dala: I would encourage them to do what makes them happy, while always trying to get better. It is definitely good to have another person to bounce ideas off of and to help with editing, but ultimately you want to be able to trust your instincts. They are what make you unique. 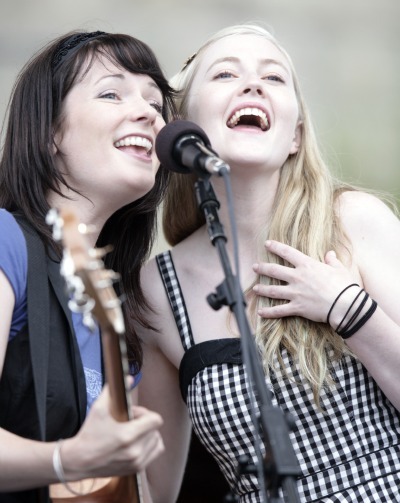 Dala: One of the happiest moments in my life was when Amanda and I performed on the main stage at the 50th Anniversary of the Newport Folk Festival. It was a perfect, sunny day, and I felt like we were making our mark. I will never forget that moment. BM: What do you see yourselves doing in 5 years time? Dala: I hope that we can keep writing and performing. I would especially love to tour in Australia, Ireland and England in the next few years. Dala: I am pretty indecisive, but I did recently read this quote and I like it a lot. It's by Mary Oliver, the American poet "I don't want to end up simply having visited this world". BM: Thank you girls, you're awesome!! Very nice interview. This band is great, I love the music and style. Thanks for sharing Dala. I'm in love with their music! Fabulous! Thanks so much for bringing their music to our attention. They're great!